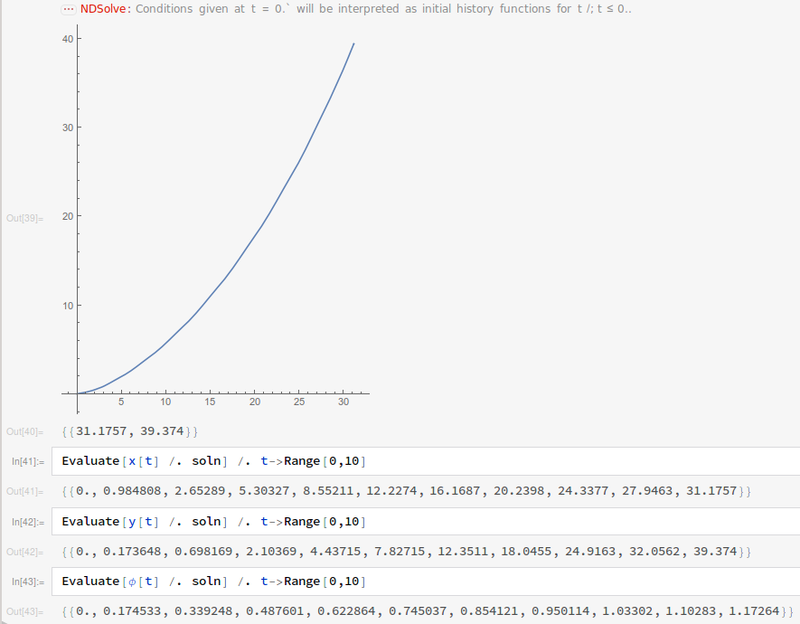 As a learning project, I’ve been trying to forwards-integrate Robocode physics using Mathematica. Robocode is a programming game where two or more tanks battle in a 2D arena, attempting to hit enemies while simultaneously dodging bullets. 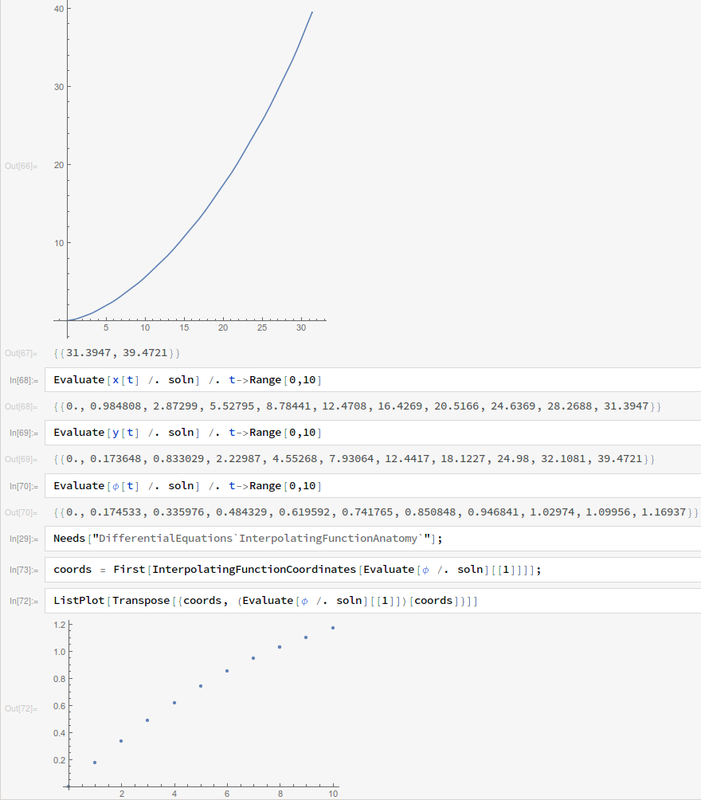 In order to better determine all the possible locations my tank could move to given an initial state and fixed time horizon, I decided to use Mathematica to numerically integrate Robocode tank physics over a range of different control inputs. 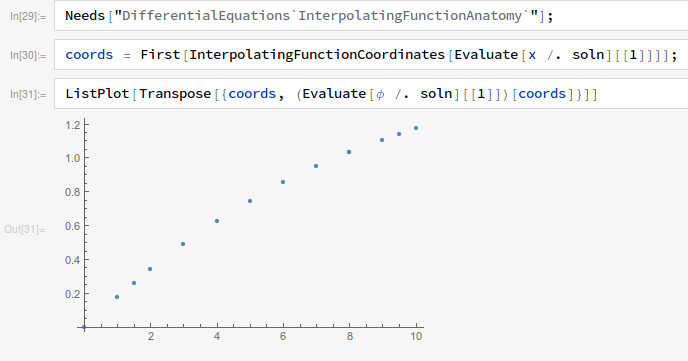 Ultimately, I was quite impressed with how Mathematica’s NDSolve could handle some weird discrete physics—however, there are a lot of tricky issues that you have to watch out for (hence why I’m writing this post). Robocode works with discrete time steps called ticks. We’ll describe our tank’s state using four variables: the position , the velocity , and the orientation . The movement physics are described here so I won’t go over them in detail. The control inputs are the acceleration , with a maximum of 1 when accelerating and 2 when decelerating, and the angular velocity , bounded by . The integration scheme is essentially Implicit Euler with constant step sizes of one tick (however, this has some caveats as we’ll find later). There’s a lot of other weird corner cases that make this problem more difficult than it first appears. My hope is by going through and addressing these issues you can learn why your numerical solution for discrete systems is misbehaving. We’ll start with a simple, naive approach and build up from there. At tick 10, we see that the tank has actually traveled 52 pixels (ignoring rounding errors). What gives? The key lies in looking at the data for the first tick. 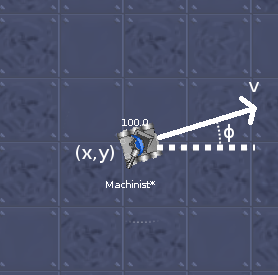 After one tick, the Robocode tank has traveled 1 pixel and has a velocity of one pixel/tick. Our Mathematica solution after one tick gives the robot a velocity of one tick per second but only says it’s moved half a pixel. This discrepancy is due to the Robocode’s Implicit Euler integration scheme, where the change in position between two ticks is equal to the velocity at the later tick times the time difference. 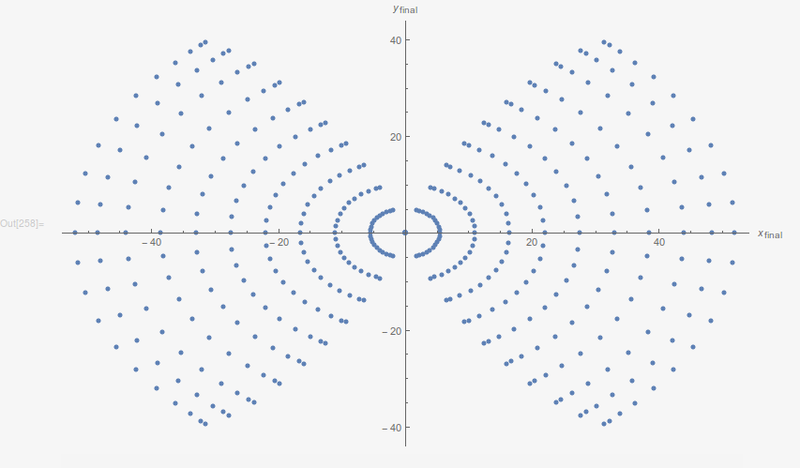 The end position is way off, but more informative is the fact that after the first tick, the Robocode tank rotated by a full 10 degrees (0.1745 radians) whereas the Mathematica simulation rotated by just 9.25 degrees (0.1614 radians). The Mathematica result is to be expected since in the dynamics we clipped the rotational velocity to be and after one tick with maximum acceleration the velocity should equal one. However, the fact that the Robocode tank rotated a full ten degrees indicated that the rotational bounds were actually computed using velocity from the last tick; this was confirmed by looking at the Robocode source. Tank end positions starting from rest and sweeping over all possible acceleration and turn settings. In the second graph, the points in each horizontal slice represent the extreme possible positions of one specific starting velocity (essentially the boundary points of the previous graph). When these are stacked on top of each other over a range of possible initial velocities, this interesting 3D shape is the result. I used Mathematica 11.0.1.0 for this project–later versions may fix some of the problems I encountered. 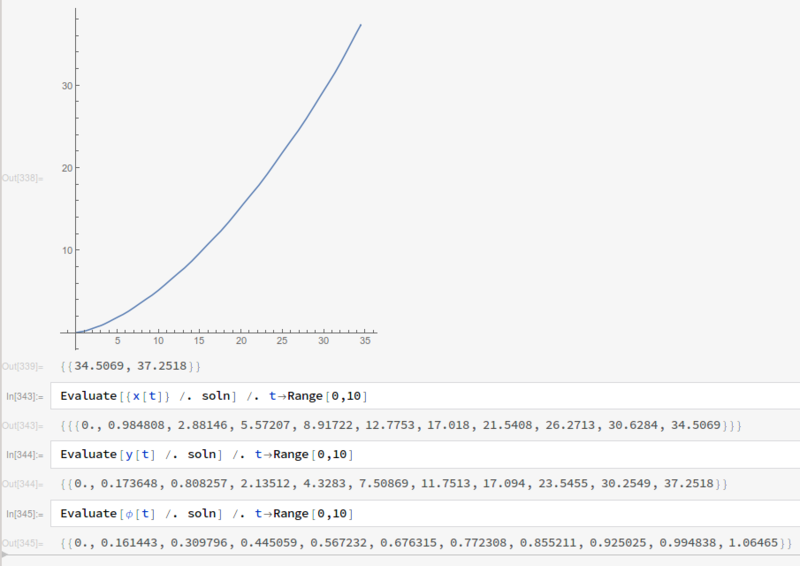 This was also my first time working with Mathematica so don’t take my code as any kind of style guide. Regardless, I hope you can use some of my experiences to debug your own NDSolve issues.